Learn about the services and staff of the veterinarians at Frederick County's Jefferson Veterinary Hospital. Located in beautiful Frederick County, MD and serving the surrounding areas. Dr. Ahalt was born and raised in Frederick county, Maryland. He grew up in Jefferson MD, attending school in Middletown MD from elementary through to high school. 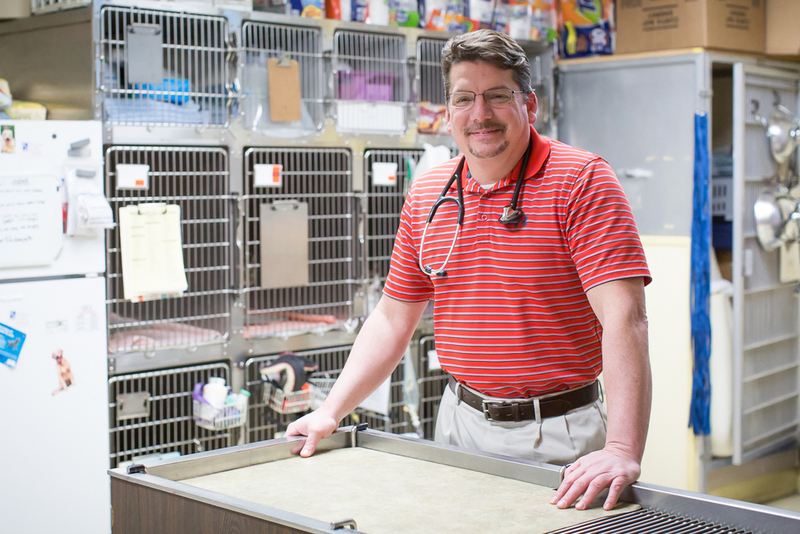 He has practiced at Jefferson Veterinary Hospital since 1999 and became the owner of the practice in 2004. Dr. Ahalt was awarded his BS in biology from Elon College, North Carolina, and his Doctor of Veterinary Medicine from Mississippi State University College of Veterinary Medicine. Following his graduation, he followed his passion and completed an intensive 12-month small animal medicine and surgery internship at Oklahoma State University. Dr. Ahalt enjoys all aspects of practice but has a special interest in soft tissue surgery and oncology (the medical and surgical treatment of cancer). He strives to be the best advocate for your pet’s health and provide the best services for both you and your pet. Dr. Ahalt lives on a small horse farm in Frederick MD where he raises his five children Cole, Zeb, Luke, Cade and Isla. He has a Great Dane, a Samoyed a spoiled French Bulldog, a ragdoll cat and a variety of long haired barn cats who help with mouse control and provide a friendly face when he is out at the barn. He is an avid sports fan (go Terps, Caps, O's and Skins!) and enjoys a variety of outdoor activities. Dr. Kalf lives in Jefferson, MD. She graduated from Tuskegee University, School of Veterinary Medicine in 2005 and spent her first year of practice performing a rotating medical, surgical, and anesthesia internship at Rood & Riddle Equine Hospital in Lexington, KY. To further her education to become a specialist, she then performed a three year residency in large animal internal medicine at the University of Pennsylvania. Dr. Kalf was granted Diplomate status by the American College of Veterinary Internal Medicine (Large Animal) in 2009, and later began practicing on small animals as well. Although Dr. Kalf enjoys all aspects of veterinary medicine, some of her special interests include gastroenterology, neurology, ophthalmology, and preventative medicine. Outside of work, she loves spending time with her boyfriend, Rob, and their two children, Camden and Hayden. She also enjoys taking care of the sheep they raise, going to the beach, watching Kentucky basketball, and the New England Patriots.